Photos from the recent 5/22/2016 Pre-Memorial service held at Inglewood Park Cemetery. Courtesy of Caroline Brechin. The Allied Veterans Council is conducting a Memorial Day Service on Monday 30 May, 2016 at 10:00 a.m. at the Live Oak Memorial Park, 200 East Duarte Road, Monrovia, CA 91016. All interested persons are welcome and encouraged to attend. Drinks available after the ceremony at VFW Post 2070. 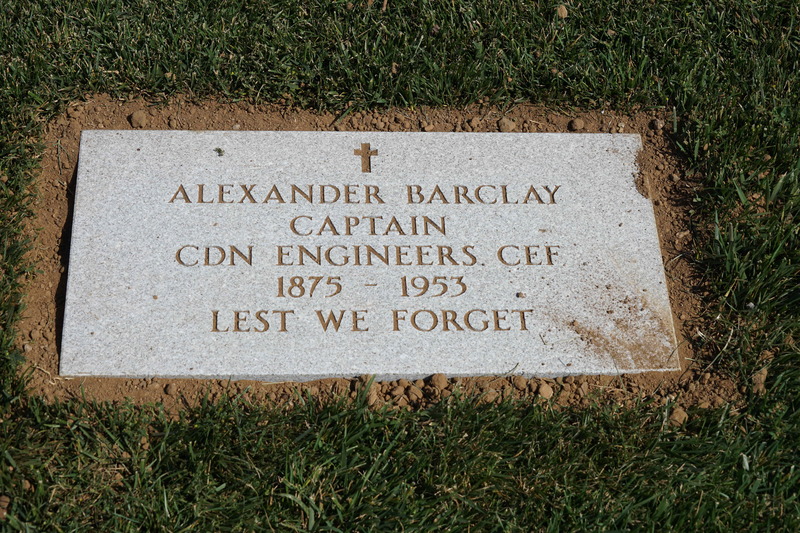 Approximately 150 Canadian veterans of World Wars I and II have rested in unmarked graves in the Inglewood Park Cemetery, Inglewood, California for many years. Following a 5 year effort by Veterans Affairs Canada and the Royal Canadian Legion in California the first 10 markers have been set to honor these men and women. The balance will be set over the coming months. Now we need to find the right agency in the British Government that will do the same for their veterans that rest nearby. 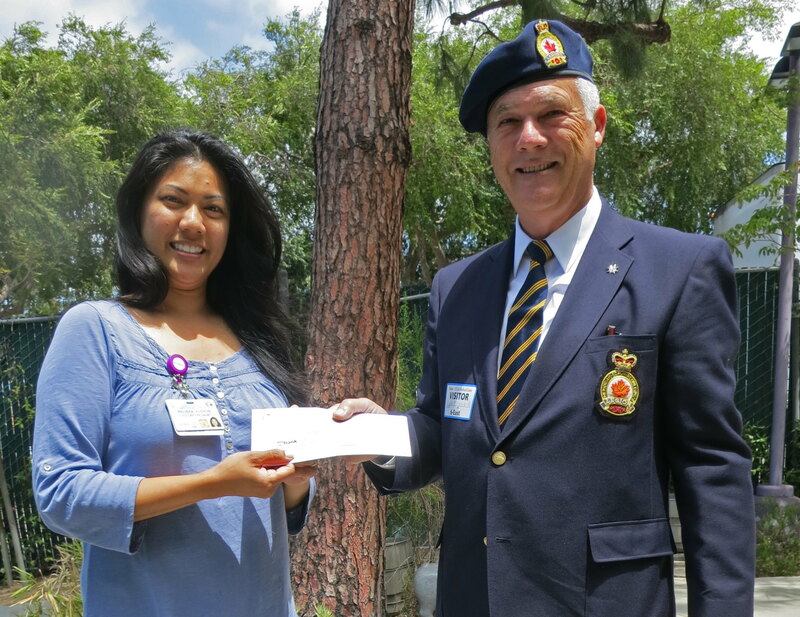 The Royal Canadian Legion plans to have a booth at the Scottish Festival in Costa Mesa on May 23rd and 24th, 2015. Tom Rödl of the California Branch 156, presents a $1000 check to the Director of Child Life Services, Melissa Hebron, at the Harbor-UCLA Medical Center to use for the comfort, education and entertainment of their pediatrics patients, and their families, to make their treatments successful and their time in the facility as pleasant as possible. This photo was published in a recent issue of The award winning publication, The Legion Magazine. Some may wonder what activities the Royal Canadian Legion does in California since we are so far from Canada. 1. On Remembrance Day a service to honor “the fallen” is held at a local American Legion hall, then on Memorial Day we hold a memorial service at the Inglewood Park Cemetery in Inglewood to honor “the fallen”. 2. Our various Branches and the Zone make donations to many different charities in the communities where funds have been raised. 3. The Inglewood Park Cemetery is the final resting place of many British Commonwealth veterans, many of these men and women fought in WWI and WWII. It was recently discovered that approximately 160 of the graves are unmarked so our Zone is working with Veterans Affairs Canada to have a headstone placed on each veteran’s grave. 4. Many of the headstones that are in place have become damaged over the years so we are working with the cemetery to have them replaced. 5. Our San Francisco Branch is deeply involved with supporting the Sea Cadets, Arkansas Division in their area. 5. We keep in touch with, and are a resource to, many living and aging veterans and their spouses that live in the Western US. 6. It takes people to do all of the above so we are always looking for new members – please consider joining us. 50 year member Charles Brechin (on the right) received a much deserved Palm Leaf to MSM Award from Zone Commander Robert Edmonds, MBE at a ceremony in Manhattan Beach on December 15th. The Palm Leaf is the highest award that a Legion member can receive. Charlie has held many posts at the Zone as well as the Branch level over the years and has been active in building the membership and charity projects within the community. Congratulations to Charlie! Click on the link below to read The Legion Magazine article on our Inglewood Cemetery project.